Part No : ADN14243. NISSAN SUNNY N14 1990-95 (LHD) 2.0i H/b - GTi-R 4 x 4 5 MTM SR20DET N14 01/92>02/93. NISSAN SUNNY N14 1991-95 2.0i H/b - GTi FWD 5 MTM SR20DE N14 01/92>12/95. NISSAN SUNNY N14 1991-95 2.0i H/b - GTi-R 4 x 4 5 MTM SR20DET N14 01/92>02/93. Brake Pads. Position: Rear Axle. Other Information. NISSAN 4106050Y94, 4106062C90, 4106063C90. NISSAN SUNNY Mk III (N14) 1.6 i Saloon Petrol 10/1990 05/1995 FWD 16 90 66. NISSAN SUNNY Mk III (N14) 1.6 i 16V 4WD Saloon Petrol 10/1990 05/1995 AWD 16 90 66. NISSAN SUNNY Mk III (N14) 1.4 i Saloon Petrol 10/1990 05/1995 FWD 16 75 55. 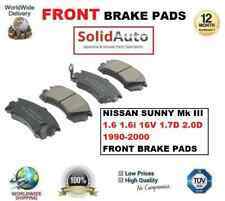 NISSAN SUNNY Mk III (N14) 1.4 i 16V Saloon Petrol 10/1990 06/1995 FWD 16 87 64. NISSAN SUNNY Mk III (N14) 1.6 i Saloon Petrol 10/1990 05/1995 FWD 16 90 66. NISSAN 4106050Y90 4106050Y91 4106050Y93 4106050Y94 4106062C90 4106063C90 4106063Y90 D106050Y90 D106050Y92 D106050Y93 D106050Y94 D106062C90 D106063C90 D106063Y90 D106M50Y94 DA06M50Y93. NISSAN SUNNY Mk III Hatchback (N14) 1.4 Hatchback Petrol 10/1990 06/1995 FWD 16 82 60. NISSAN 4106050Y91, 4106050Y94, 4106062C90, 4106063C90, D106M50Y94. NISSAN SUNNY Mk III (N14) 1.4 Saloon Petrol 10/1990 06/1995 FWD 16 82 60. NISSAN SUNNY Mk III (N14) 1.4 i Saloon Petrol 10/1990 05/1995 FWD 16 75 55. (Reference : BP229). 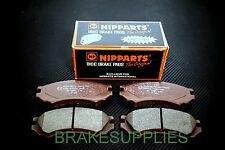 Brake Pads. Cherry - Mark 3. 1982, 1983, 1984, 1985, 1986, 1987, 1988, 1989, 1990. Set of 4 . FIRST LINE. Fits the following vehicles :-. Wed / Sun : CLOSED ( all orders still despatched). NISSAN 4406015A85, 4406015A87, 4406050A86, 4406058Y86, 4406073A85. NISSAN SUNNY Mk III (N14) 1.6 i Saloon Petrol 10/1990 05/1995 FWD 16 90 66. NISSAN SUNNY Mk III (N14) 1.6 i 16V 4WD Saloon Petrol 10/1990 05/1995 AWD 16 90 66. Part Number : DP4665R. 1.8 GTI (N13). Yellowstuff is especially appreciated on Trucks for towing and heavy loads and where wheel and tire oversize upgrades have been fitted. There is no guesswork here. NISSAN SUNNY Mk III (N14) 1.6 i Saloon Petrol 10/1990 05/1995 FWD 16 90 66. NISSAN SUNNY Mk III (N14) 1.6 i 16V 4WD Saloon Petrol 10/1990 05/1995 AWD 16 90 66. NISSAN SUNNY Mk III Hatchback (N14) 1.6 i Hatchback Petrol 10/1990 05/1995 FWD 16 90 66.